We are heading to New Orleans for two of our favorite only-in-New-Orleans events, St. Joseph’s Day (March 19) and the Sunday closest to it, known as “Super Sunday” (which we can assure you has nothing to do with the Super Bowl). Super Sunday is the day when Mardi Gras Indians parade their finery through the streets, and St. Joseph’s Day is a holiday with origins in Sicily that celebrates the miracle of St. Joseph saving the island from famine (see our previous coverage here). And oddly enough, these two days are related, and Mardi Gras Indians also march on St. Joseph’s night. Though other areas in the US obviously have Sicilian-American populations, the tradition of the St. Joseph’s Day altar is observed with fervor in New Orleans, owing to its particularly concentrated Sicilian population. St. Joseph’s Day is observed in New Orleans to a much larger degree than it is elsewhere, even Sicily. Every Catholic church and high school in greater New Orleans seems to have an elaborate St. Joseph’s Day altar, and they can range from modest altars in homes to unthinkably huge, sometimes taking up the entire Church community center. The altars, contributed to by parishioners and the community, traditionally have three tiers and are decked out with statues, flowers, photos, candles and food. All of the photos in this post are from altars we visited in 2016. 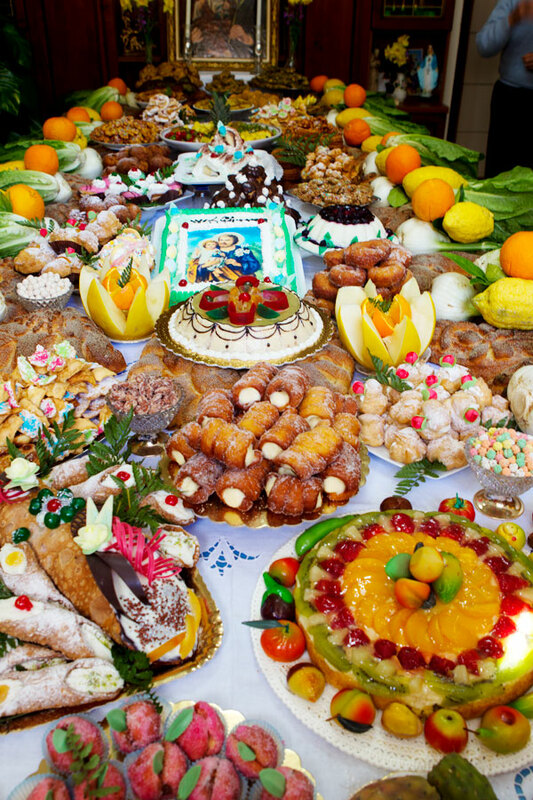 Typical St. Joseph’s Day altars are decked out with tons of food, including citrus, fanciful breads in shapes representing Joseph’s trade as a carpenter (or even fish or figures), whole fish, dozens of varieties of cookies, fava beans, and more (You may even see a lamb cake or two). And if you visit a church on St. Joseph’s Day in New Orleans you will probably be treated to a bowl of Pasta Milanese or other meatless favorites. Pasta Milanese is similar to pasta con sarde, but with tomatoes, and of course you have to top it with breadcrumbs, representing the Joseph’s carpentry sawdust – check out this recipe from Sicilian Girl. Our favorite St. Joseph’s Day food is probably the fig-filled cuccidati cookie, which are also traditionally made at Christmas. We bought a cookbook on St. Joseph’s Day at one of the churches we visited a few years ago, which now provides us with our go-to cuccidati recipe. The St. Joseph’s Day altars are cookie heaven, and volunteers spend weeks making literally tens of thousands of cookies for some of the larger altars. We also like to seek out some of the unique foods that are probably unseen outside of a single parish, like the amazing, giant, fleur-de-lis crawfish-shaped “Craw-fig” cookie below, that we spotted on an altar in Metairie. At the end of St. Joseph’s Day, the altar is symbolically broken in the “Tupa tupa” ceremony and the food and donations are distributed to charity. You will probably also get handed a fava bean for luck, and a bag of cookies to take home. And if you manage to steal a lemon from the altar it means you will get married (or have a baby) by the next St. Joseph’s Day. We love to go around New Orleans and the surrounding area on St. Joseph’s Day and visit all of the altars, since no two are alike. For 2018 we found a few guides (Italian American Center, ABC) to all of the St. Joseph’s Day churches in the area. One of our favorite – but lesser known in the US – food holidays is right around the corner: St. Joseph’s Day. St. Joseph’s Day is widely celebrated in Italy and the among the Italian diaspora in the US and elsewhere on March 19th. 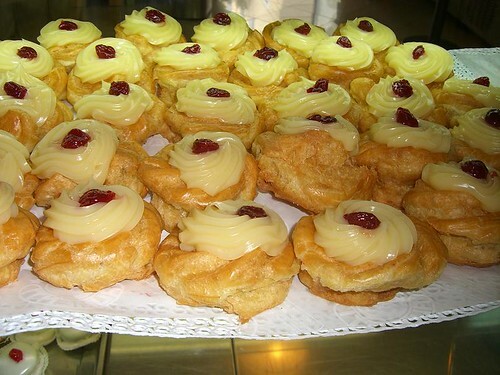 We have previously covered some St. Joseph’s Day sweet treats, including the perennial favorite zeppole. However, one of the showstoppers on St. Joseph’s Day is actually St. Joseph’s Bread (Pane di San Giuseppe). You can find recipes for Pane di San Giuseppe at Kitchen Link and Mangia Bene Pasta. It is a bit more of a complicated bread, but it also allows for it to be sculpted into equally complicated shapes, like staffs, carpentry tools, and wheat, which are a must on the St. Joseph’s Day table. This altar below, from Trapani in Sicily is probably as detailed as you can get! We have previously written about partaking in Sweet Zeppole for St. Joseph’s Day – one of our favorite holiday treat traditions. However, we were never even aware there was a savory variety of Zeppole. However, it seems that in the region of Calabria, savory Zeppole are a preferred option. Zeppole are basically fried dough fritters, so it make sense they could toe the sweet/savory line. Savory Zeppole can be made with anchovies or served plain. It seems like they would would probably go perfectly with another popular St. Joseph’s Day dish: Pasta con Sarde (with sardines). Happy St. Joseph’s Day! Why not celebrate with a delicious Zeppole? I got this one from Bennison’s Bakery (1000 Davis in Evanston). Following my post on St. Paddy’s day eats, I have to mention St. Joseph’s Day, a holiday in Italy which is accompanied by a delicious treat called the Zeppole. A zeppole is a fried donut-like pastry that is filled with jam or cream and topped with powdered sugar. They are traditionally made especially for St. Joseph’s Day. About.com has a simple recipe, as well as an extensive history of the humble zeppole. St. Joseph’s Day (March 19) is one of the biggest holidays in Sicily (and some other parts of Southern Italy). Joseph is the patron saint of Sicily since people say that in the middle ages peasants prayed to him and he ended a drought. Now, in remembrance of this feat, some Sicilians create altars full of food and plenty in honor of the day. Fava beans, the crop St. Joseph saved, are popular, as are citrus fruits, which happen to be prolific in Sicily. The tradition has spread to places with large Sicilian immigrant populations, especially New Orleans. There is a lot of interesting history of Louisiana altars (like the one at right) at the Houston Institute for Culture. This year, I found a list of places with “St. Joseph Tables” in Chicagoland in the Sun Times. I imagine it would be a cool experience to go to one.